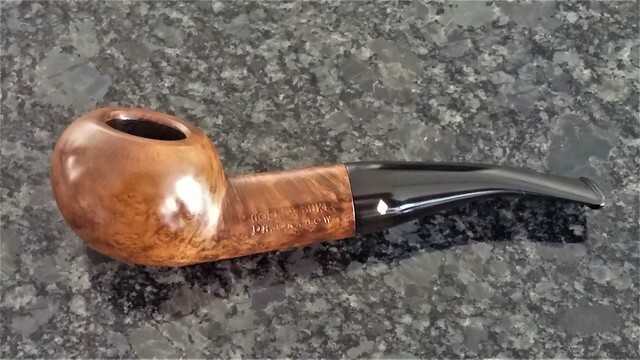 I’ve been working on quite a few old Brigham pipes recently, so this Grabow Golden Duke Author was a welcome respite when I pulled it from my box of pipes waiting refurbishment. 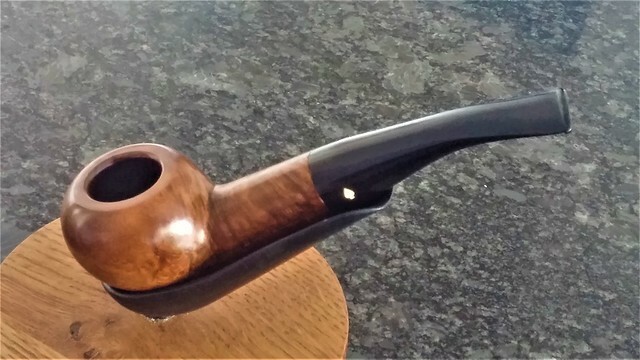 It has that classic chubby shape that, at least for me, holds a timeless appeal and the promise of a cool smoke thanks to its thick bowl walls and stout shank. 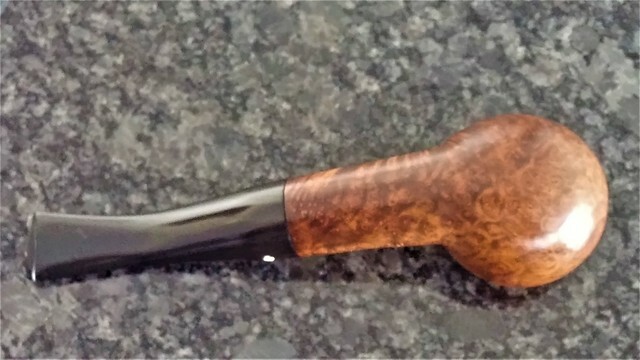 The pipe was in decent estate condition when it arrived on my worktable. 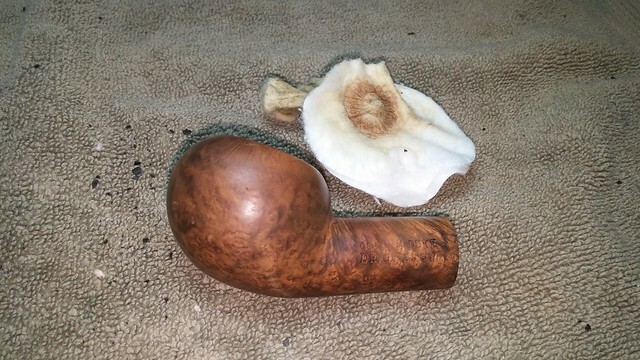 It was dirty, of course; the briar felt oily in the hand, the pipe’s rim was hidden under a crust of lava, and the shank had random dark splotches of some kind of grease or perhaps adhesive residue. The stem was oxidized a very unappealing yellow/brown colour, and the bit showed a small constellation of tooth dents on both top and bottom surfaces. 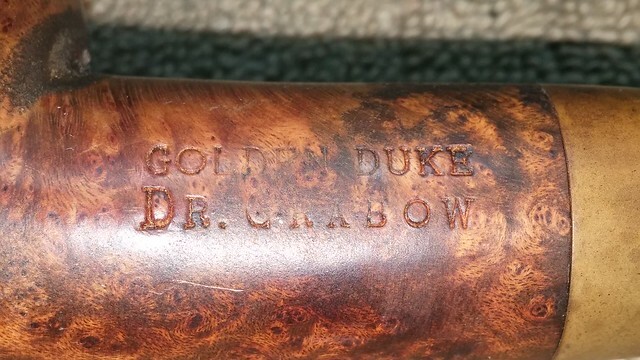 The pipe is stamped “GOLDEN DUKE” over “DR. 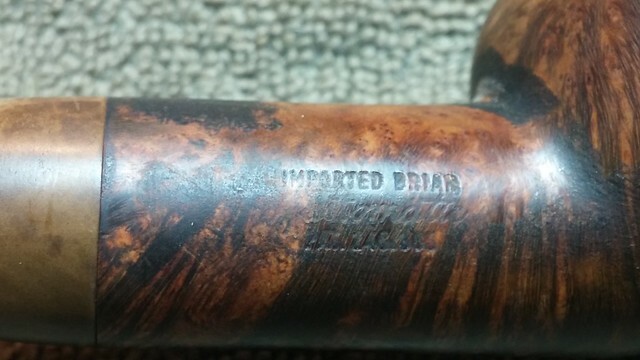 GRABOW” on the left shank, and “IMPORTED BRIAR” over “Adjustomatic” over “PAT. 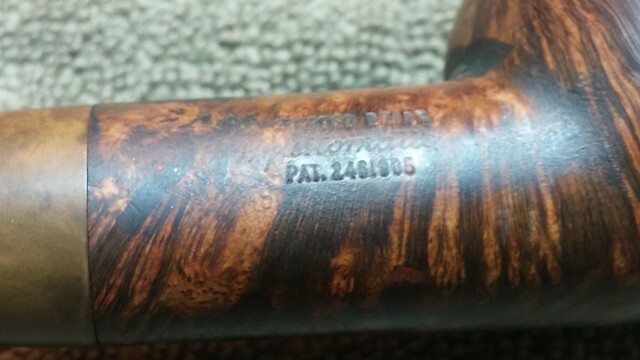 2461905” on the right shank. A bit of research turned up that, while the Adjustomatic patent was first granted in 1946, the Golden Duke line wasn’t introduced until 1964. 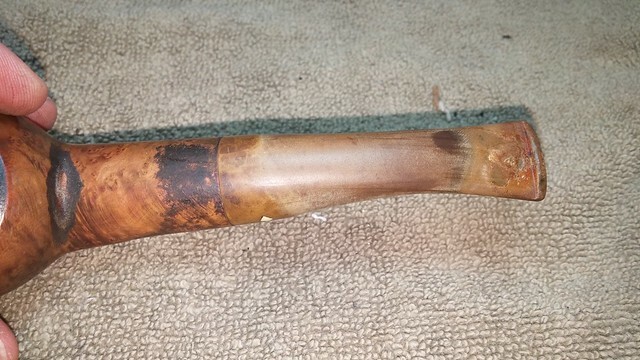 I estimate this pipe to hail from the late 1960s to perhaps mid 1980’s. 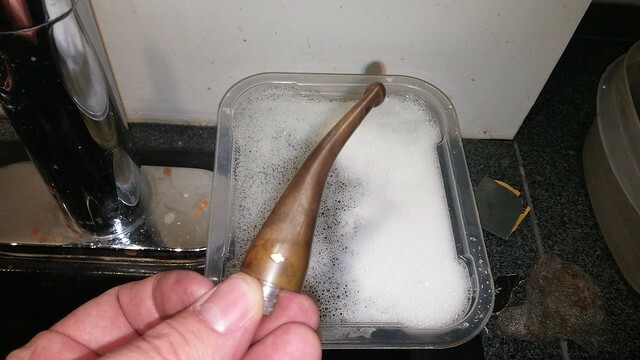 Starting off this refurbishment, I ran a pipe cleaner through the stem’s airway to make sure it was open before dropping the stem in to a bath of Oxyclean and warm water. I left it overnight to raise the oxidation. 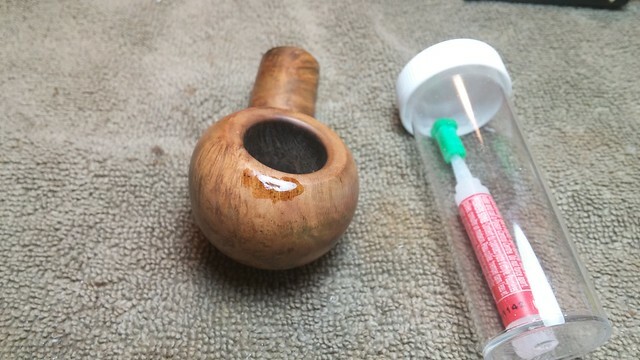 The soak would also dissolve a lot of the tars and other contaminants inside the stem, making cleanup that much easier the next day. 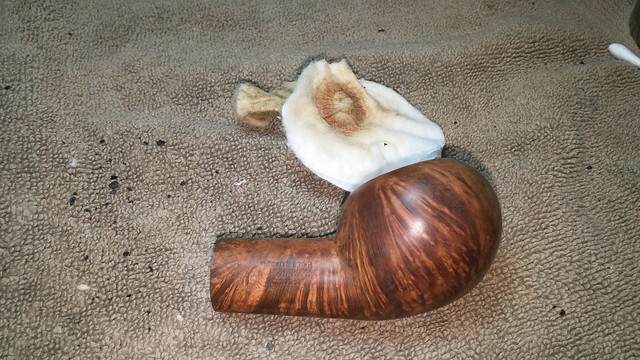 While the stem lounged in its bath, I wiped away most of the surface grime from the stummel wtih alcohol on a cotton pad. The greasy, sticky blotches came right off, revealing some lovely grain – tiger stripes on the right side, and birdseye underneath. 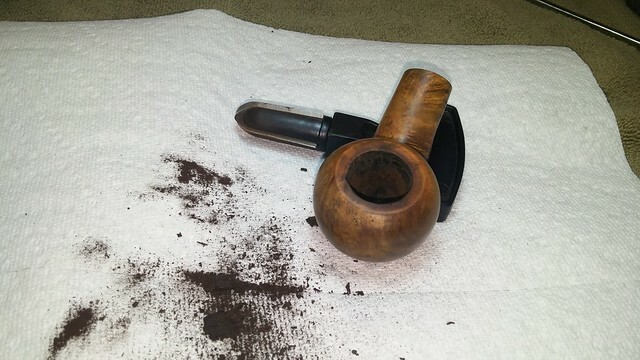 I reamed the chamber back to briar using my Castleford reamer set and gently scraped the lava crust from the bowl rim with my old pen knife. 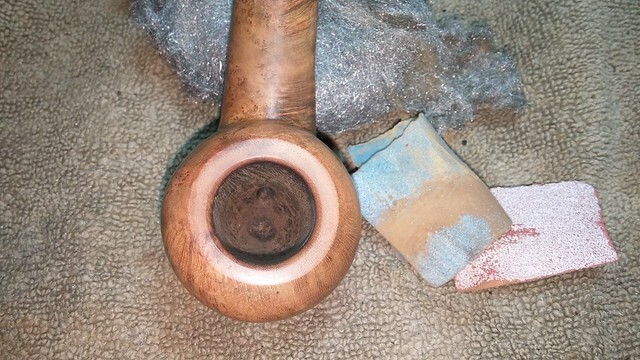 Both chamber and rim proved to be in very good condition under their respective carbon shells. The remaining film of lava came off the bowl rim with a very light topping on 320-grit sandpaper. 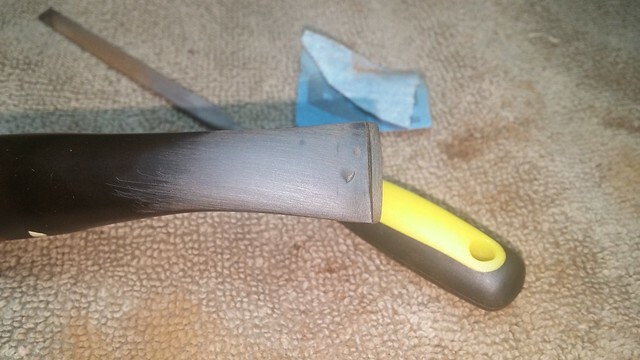 I followed this up by gently shaping the inner rim to remove a few stray nicks and scratches. 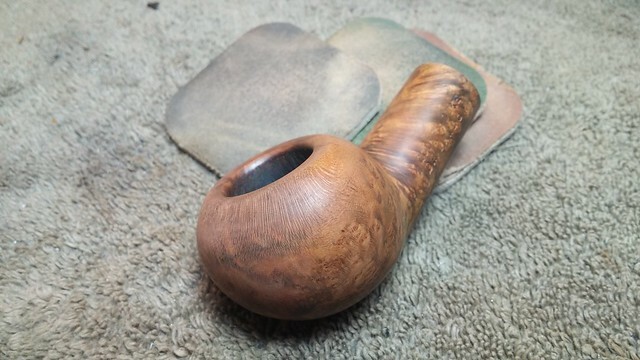 There was more exterior work to be done, but I moved to the interior of the stummel at this point. 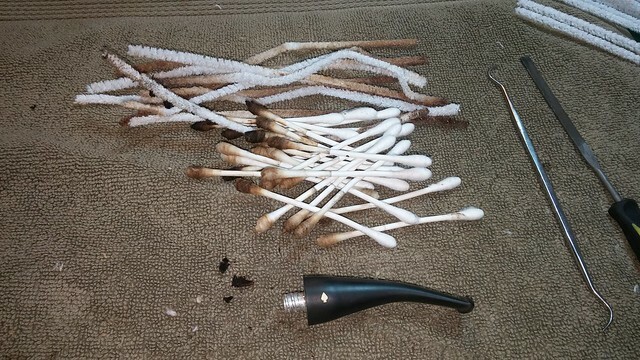 Pipe cleaners, cotton swabs, scrapers and lots of alcohol were needed to expunge the tars, gunk and debris from the shank and airway. You can see the solid plug of tars that came out of the shank in the lower left of this pic. 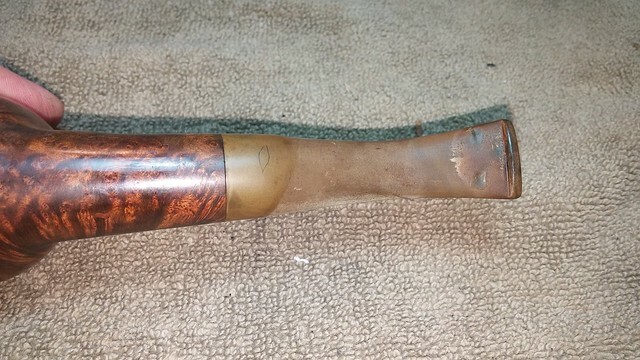 I cannot image that this pipe smoked very sweetly with that inside! The stem proved to be equally as grungy on the inside. 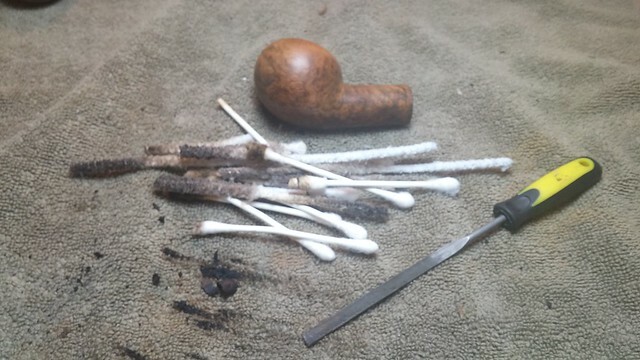 After pulling from the Oxyclean bath and scrubbing away the softened oxidation, I used a second pile of pipe cleaners and cotton swabs with alcohol to clear the stem’s airway. 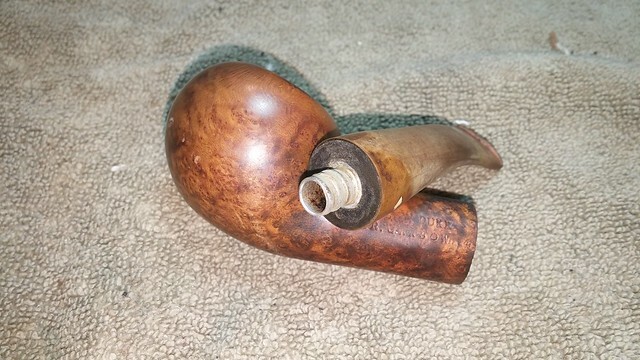 I’m guessing the last piper was not a fan of the Grabow paper filters – you can see in the pic just how much crud had accumulated inside the filter slot. While I had the stem in hand, I heated the bit over a lighter flame in an attempt to lift the worst of the tooth dents. Sometimes this works and sometimes it doesn’t, but it’s always worth a try. 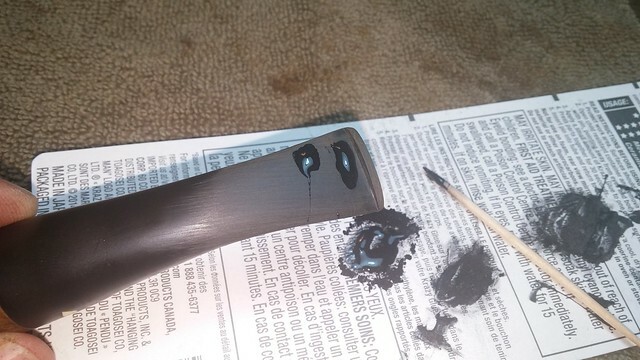 In this case, the heat treatment was only partially successful; I would have to fill the remaining dents. 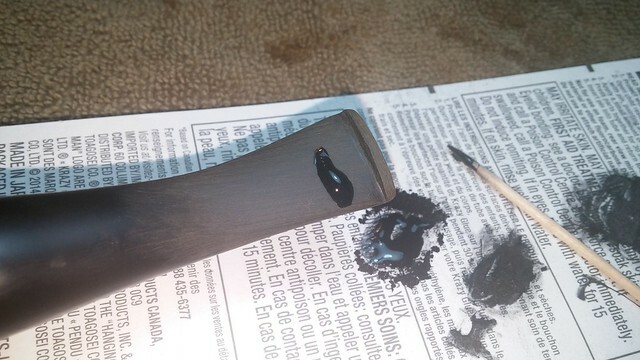 I mixed a batch of CA glue and activated charcoal powder and drop-filled the tooth dents. When the patch mixture had fully cured I filed them flush with the surrounding vulcanite and polished the stem with micromesh pads. Cleaning the stummel had exposed a bit of “road rash” on the front face of the bowl, likely caused by careless dottle knocking. 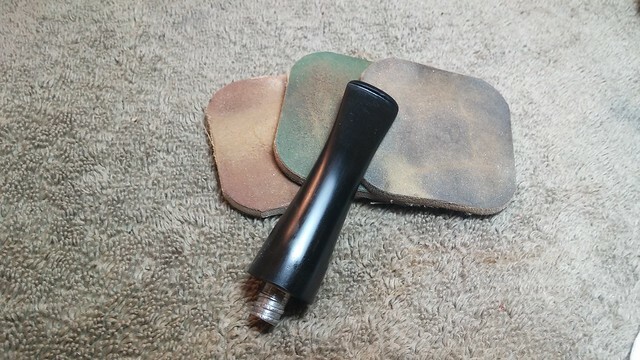 I took a half-and-half approach to repairing the abrasion, first sanding the worst of the damage smooth before filling the remaining micro-pits with clear CA glue. 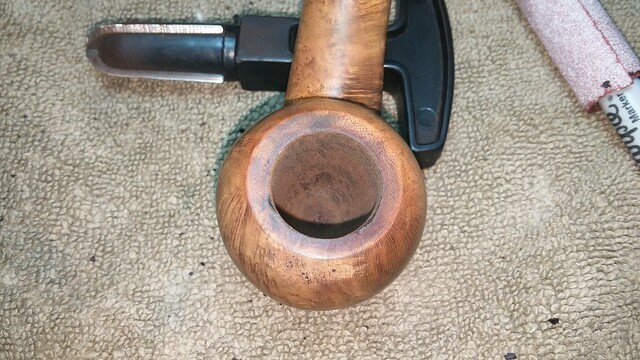 This tactic avoided sanding a flat patch on the front of the very round bowl. 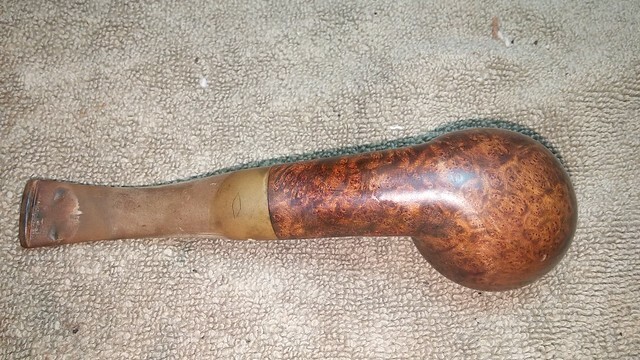 With the damage repaired, I gave the entire stummel a once-over with micromesh pads. 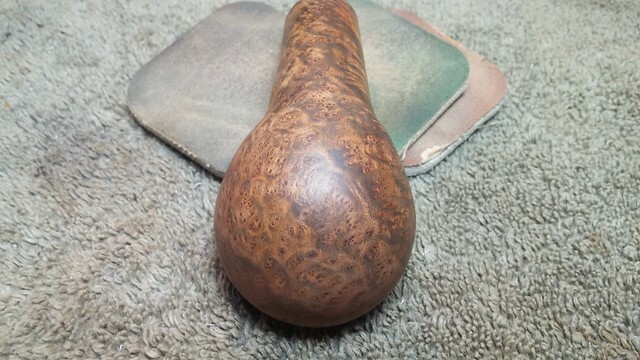 Each set of three pads noticeably improved the briar’s colour and shine and brought the grain into higher contrast. 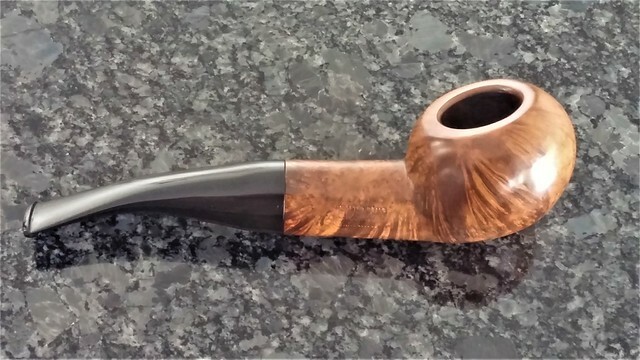 Both the contrast and the shine on the briar increased further when I took the finished pipe to the buffing wheel. 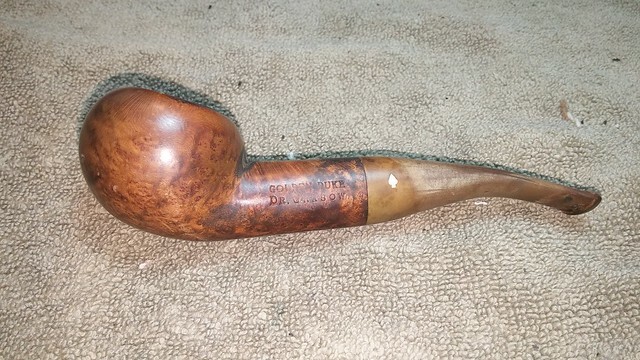 White Diamond compound and several coats of Carnauba wax to both stummel and stem really brought the pipe back to life. 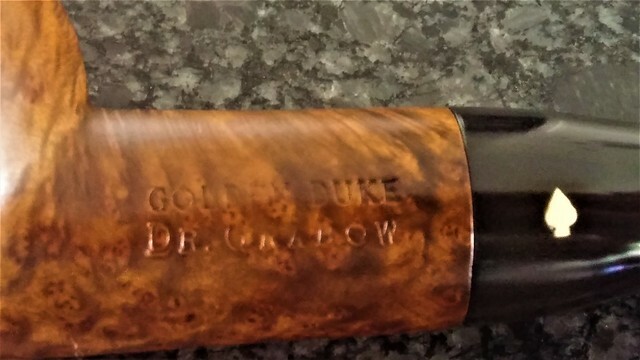 This Dr Grabow Golden Duke is once again living up to its name – the briar glows a dark honey-brown with darker grain behind, and the stem shines a deep black, showing off the white Grabow Spade logo to best effect. 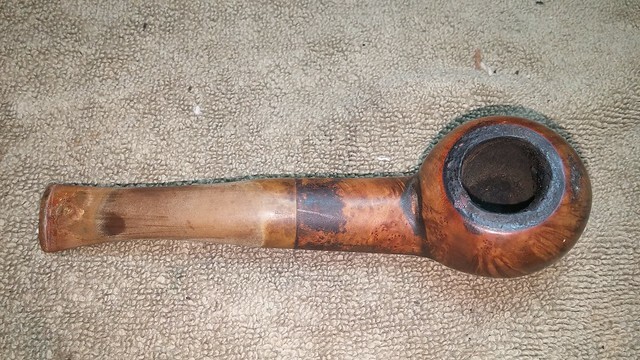 This pipe is ready to provide years of companionship to a new piper. 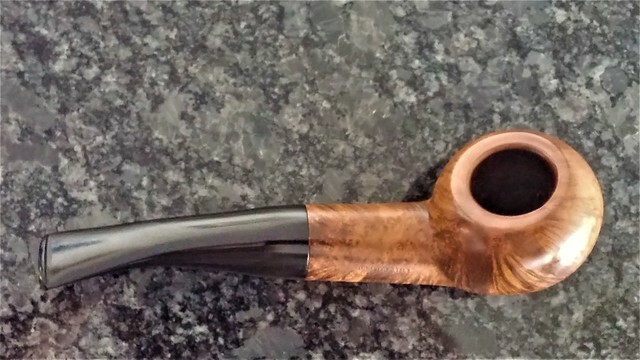 If you’d like to add this Dr Grabow Golden Duke Author to your rack, or perhaps get an early start on your Christmas shopping this year, you can find the pipe for sale at the DadsPipes Store now. 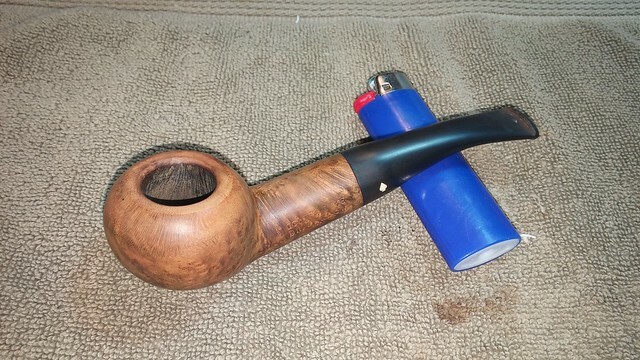 Nice work and a fine looking pipe, Charles. Thanks David. 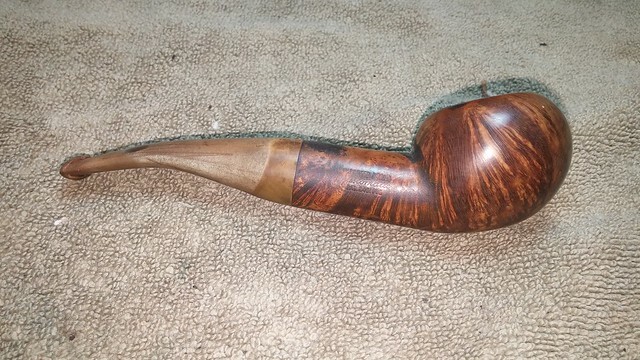 I like the chubby shape of this one. 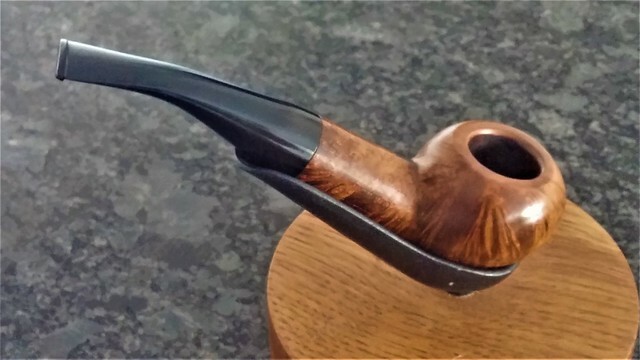 This is one of my favourite old Grabow shapes. 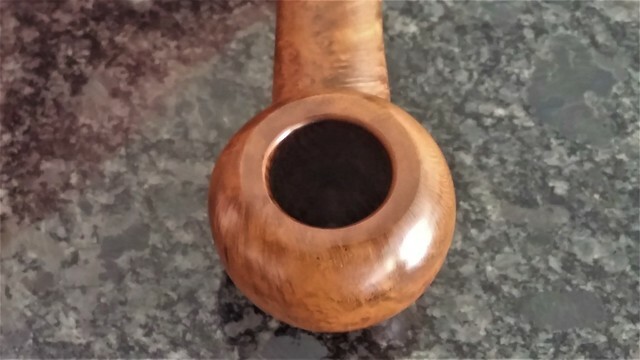 This one is a classic shape and a beautiful piece of briar. Well done Charles. Thanks Steve. 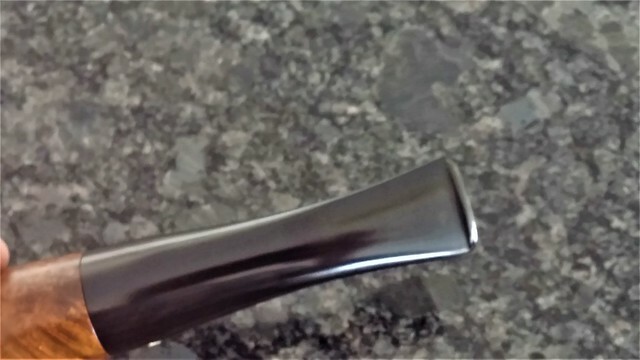 This Grabow shape plays right in to the classic Peterson 999/Savinelli 320/GBD 9438 theme. Well I just can’t resist asking – – – – – – – What did ” Adjustomatic ” mean ??? Hi Vince. 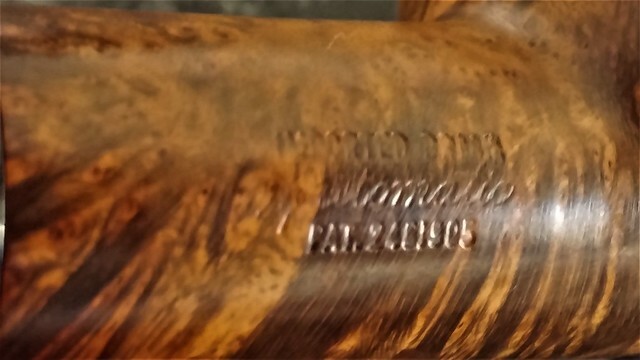 The Adjustomatic patent refers to the fitment between stem and shank. 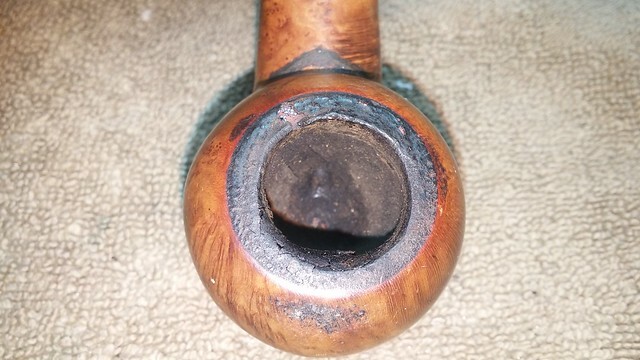 Over time, the screw-in stem tenon becomes misaligned with the shank. 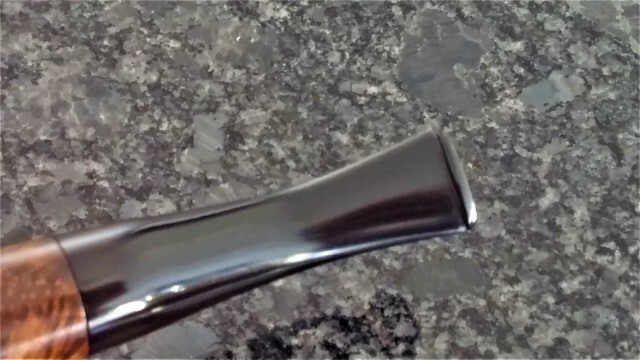 The Adjustomatic fitting allows the stem to be readily realigned without removing & replacing the aluminum tenon or mortise. Wow, did that come out great. Nice work.